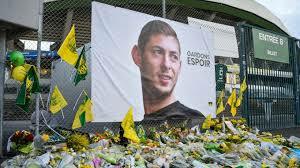 February 5 – A body has been seen in the underwater wreckage of the light aircraft which was carrying former Nantes forward Emiliano Sala and his pilot to his new club Cardiff City and which tragically disappeared over the English Channel, according to air accident investigators. The wreckage was discovered on Sunday two weeks after Sala was en route to Cardiff to make his debut for the Premier league club. The Argentine-born striker had recently signed for a reported club record £15 million and was heading back to the Welsh capital after saying farewell to his former teammates in France. With the official investigation called off, a privately funded underwater search was launched at the request of Sala’s family and now rescue teams are now developing a recovery plan for the plane, which lies on the seabed 67m below water. “There’s a much greater chance they (the Sala family) will get answers if (the plane is) recovered,” said shipwreck hunter David Mearns.